The lives and futures of children and animals are linked to environmental challenges associated with the Anthropocene and the acceleration of human-caused extinctions. 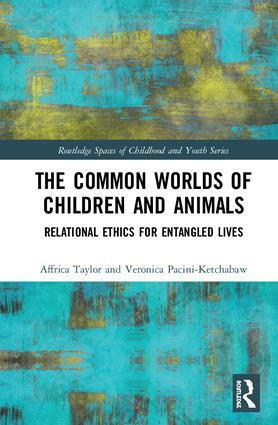 This book sparks a fascinating interdisciplinary conversation about child–animal relations, calling for a radical shift in how we understand our relationship with other animals and our place in the world. It addresses issues of interspecies and intergenerational environmental justice through examining the entanglement of children’s and animal’s lives and common worlds. It explores everyday encounters and unfolding relations between children and urban wildlife. Inspired by feminist environmental philosophies and indigenous cosmologies, the book poses a new relational ethics based upon the small achievements of child–animal interactions. It also provides an analysis of animal narratives in children’s popular culture. It traces the geo-historical trajectories and convergences of these narratives and of the lives of children and animals in settler-colonised lands. This innovative book brings together the fields of more-than-human geography, childhood studies, multispecies studies, and the environmental humanities. It will be of interest to students and scholars who are reconsidering the ethics of child–animal relations from a fresh perspective. Affrica Taylor is an adjunct associate professor at the University of Canberra, Australia. Her background in cultural geography and Indigenous Australian education have shaped her abiding interest in the relations between people, place, and other species in settler colonial societies, and in the need to decolonise these relations. She explores these themes in her books, Reconfiguring the Natures of Childhood and Unsettling the Colonial Places and Spaces of Early Childhood Education. Veronica Pacini-Ketchabaw is a professor of early childhood education at Western University in Canada. She is committed to tracing the common world relations of children with places, materials, and other species. Her books Encounters with Materials in Early Childhood Education, Unsettling the Colonial Places and Spaces of Early Childhood Education, Journeys: Reconceptualizing Early Childhood Practices, and Flows, Rhythms, and Intensities of Early Childhood Education Curriculum explore these relations.